Introducing the 2018 edition of Eco Expo Asia: (From L): Victor Li, Immediate Past Chairperson of the Hong Kong Waste Management Association; Benjamin Chau, HKTDC Deputy Executive Director; Wong Kam-sing, Secretary for the Environment of the Hong Kong Special Administrative Region; Jason Cao, Assistant Managing Director, Messe Frankfurt Asia Holding Ltd; Wolfgang Ehmann, Executive Director of German Industry and Commerce Ltd.
HONG KONG, Apr 4, 2018 - (ACN Newswire) - Hong Kong's vision for a "greener city" through a new wave of innovative waste management and recycling initiatives was outlined to eco-industry leaders and associations along with consul-generals and trade commissioners representing 16 countries at a networking lunch themed "Waste Less, Save More - Creating Business Opportunities" on 16 March 2018 at the Hong Kong Convention and Exhibition Centre. In the welcoming speech, Benjamin Chau, Deputy Executive Director of the HKTDC said the "Waste Less, Save More" theme responded to strong market demand for waste management schemes and technologies. "Waste has become a common problem for affluent societies, with ever-growing amounts of refuse, including food, produced as a result of economic expansion," he said, explaining the pressing need for imperative measures on waste management and recycling are a "committed focus" of the Hong Kong Special Administrative Region (HKSAR) Government. In his keynote address, HKSAR Secretary for the Environment Wong Kam-sing, outlined the latest Environment Bureau waste management and recycling initiatives that could offer a glimpse into a better, greener world ahead. "Waste management is a major challenge for a green city," he said, as our consumption-driven lifestyles are putting enormous pressure on landfills. "Clearly, Hong Kong needs a more sustainable way to deal with waste." The Secretary for the Environment went on to explain some of the measures Hong Kong is undertaking to address these problems. Among the city's new initiatives is the WEEE PARK, a waste electrical and electronic equipment (WEEE) treatment and recycling facility. It is a flagship government-funded waste-to-resources facility that officially opened on 19 March. Operated by a consortium formed by Germany's ALBA Group and the Integrated Waste Solutions Group, WEEE PARK is the modern face of WEEE recycling facility turning WEEE into useful secondary raw materials through a series of detoxification, dismantling and recycling processes using advanced technologies and equipment. Meanwhile, Hong Kong's first self-sustained sludge treatment facility, T PARK, marks a significant step forward in the city's waste-to-energy journey. Being one of the most technologically advanced facilities of its kind in the world, T PARK combines a variety of advanced technologies into a single complex and bring together sludge incinerators with power generation and desalination. To enhance public awareness of sustainable development, a wide range of educational and leisure facilities showcasing the benefits of a waste-to-energy approach in waste management are also open to the public. At the community level, a "Dump Less, Save More" Municipal Solid Waste Charging Scheme is to provide financial incentives to promote waste reduction at source and reduce overall disposal. In addition, Mr Wong highlighted other environmental initiatives the government is working on. Hong Kong's first organic resources recovery centre, O PARK, is a large-scale waste-to-energy facility with the major target for treating food waste generated from the industrial and commercial sectors including manufacturers, restaurants, hotels and supermarkets. Furthermore, EcoPark and the Recycling Fund are backing the recycling industry to develop enhanced technology to improve waste recovery rates. At the same time, a HK$300 million "Pilot Green" transportation fund supports the testing of green and innovative technologies for public transport and goods vehicles. The green bond issuance plan promotes the development of green finance in Hong Kong. Moreover, the government will enhance tax concessions for capital expenditure incurred by enterprises in procuring eligible energy-efficient building installations and renewable energy devices by allowing tax deductions to be claimed in full in one year, instead of the current time frame of five years. "With all these initiatives, we will make Hong Kong cleaner, and save more," pledged Mr Wong. 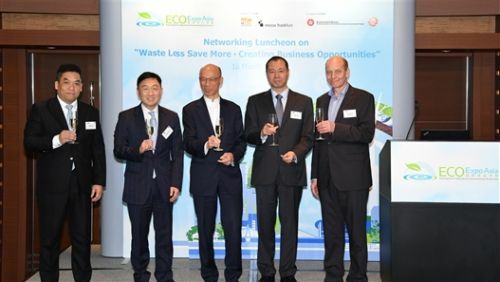 At a "chit-chat" panel discussion, Victor Li, Immediate Past Chairperson of the Hong Kong Waste Management Association, and Wolfgang Ehmann, Executive Director of German Industry and Commerce Ltd also examined the issue. Mr Li noted that waste should be considered a resource, not just waste. To capitalise on future opportunities in the sector, he said waste management should be seriously regarded as resource management:"It's just a different resource." He explained that Hong Kong is setting an example, sharing expertise with the Chinese mainland in addressing the challenge. "Hong Kong is energetic, agile and smart," he said. "We know how to find the world's leading experts. We are comfortable that we know what we are doing. We know this is the best way and we have the resources to spend." But the big question is "how to persuade Hong Kong companies to join our initiatives? We just have to wake up a lot of people." Mr Ehmann predicted that waste management and recycling was an industry set for major expansion. "It is a huge issue and challenge worldwide", he said. "Extending even beyond countries to the ocean, where revelations of giant islands of plastic waste are shocking the world." The Secretary for the Environment finally stressed that government efforts alone are not enough. As Hong Kong is set to become a key pillar of the Chinese mainland's Belt and Road Initiative, and the cities of the Guangdong-Hong Kong-Macao Bay Area seek to enhance quality living in a greener environment, he called on industry and society to work together for a more sustainable future. Looking ahead, Eco Expo Asia 2018 in October is the region's premier business platform of its kind, which last year welcomed 335 exhibitors from 18 countries and regions, and more than 14,000 buyers from 102 countries and regions, including industry leaders and members of the green tech community from Hong Kong, the Chinese mainland, Asia and beyond. "Having achieved record-breaking exhibitor and visitor numbers last year, we have much to look forward to as we prepare for the 2018 edition," said Mr Chau. "I'm sure this year's Eco Expo Asia will once again attract plenty of buyers and suppliers from around the world to Hong Kong - to do business, network and exchange ideas on innovative green solutions," he added. Waste Management and Recycling is again one of the largest exhibition zones along with Water Treatment & Quality Management and Green Transportation. A Startup zone is also an ideal platform for new ventures to showcase their green innovations and solutions to potential buyers, manufacturers and investors - with young entrepreneurs and start-ups from around the globe welcome to participate.